Through technique and subject matter, artist Yang Yongliang explores tension between ancient and modern China. When Luke Kelly first encountered the work of Chinese artist Yang Yongliang, he wasn't quite sure if he was the right person to bring it to the Utah Museum of Fine Arts. As associate curator of collections and antiquities, Kelly oversees collections from the ancient world, as well as the museum's Asian collection. But what was the proper showcase for pieces that pulled from a Chinese tradition of landscape painting and calligraphy dating back two centuries, yet which employed the modern techniques of digital photography? That fascinating juxtaposition will be on display during the salt 14 solo exhibition of Yang's work at UMFA, opening Friday, Oct. 26., most notably in the images that first captured Kelly's imagination in 2014. "His earliest works I saw were these monumental landscapes," Kelly says, "that emulated a period in Chinese history called the Song Dynasty, where they'd make these paintings that were nearly 7 feet tall, these towering mountainscapes. [Yang's] work was kind of emulating that, but it was only when you looked in detail that you saw the mountains he created were not actual mountains of rock; they were building components, power lines, cranes. ... He was taking this nearly 2,000-year-old tradition and expressing it in a completely different way." It took a few years for the exhibition to come together—in part affected by the museum's long closure for renovation in 2016-17—but finally makes its way to Utah in a show that also features a 7-minute long video installation called Prevailing Winds, and "lightboxes" showcasing the transformation of Yang's digital images into physical photographic prints. 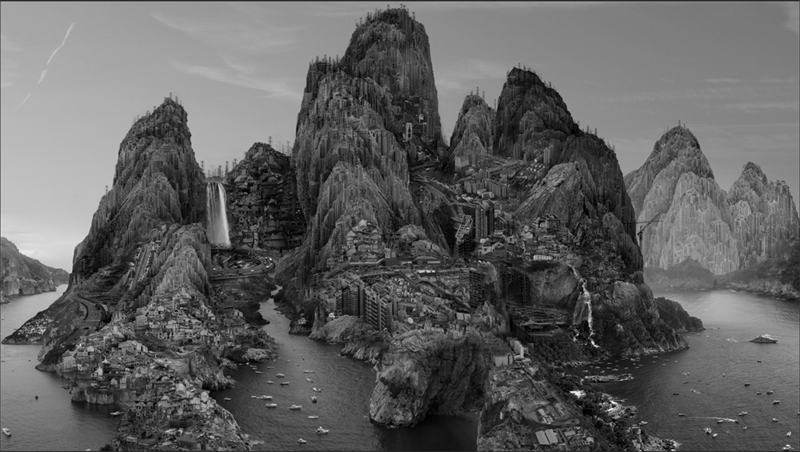 Yet there's something uniquely compelling about those digitally altered mountainscapes, which convey the imposition of increasing industrialization on the landscape of Chinese society. Kelly describes the subject matter as informed largely by Yang's background growing up in and around Shanghai during a time of explosive growth. When the artist was born, in 1980, Shanghai was a port city with a population of 5 million people; as of August 2018, the population was 26 million. "I saw [wrestler/actor] Jon Cena in an interview with Trevor Noah talking about visiting Shanghai," Kelly says, "and he saw a skyline that was like 20 New York Cities. ... Chinese urban planning is different from the 1700s and 1800s, when it was about harmony with nature. Now, urban planners are like, 'Where is the best group of workers? Are they an hour away by mass transit? Two hours away? How do we get them to a work center?' And it's these conversations that will keep continuing." Kelly believes that some of these issues—the imperative to advance economic growth, while preserving the landscape—have resonance here in Utah, even though China is dealing with them on a radically larger scale. "On the Wasatch Front, we're growing, but we think 50,000 people is a lot of growth," he says. "Now imagine a million people coming in per year. There's a desire to hold on to what makes Utah great, but at the same time, we want to grow and be successful. So there's that tension. Yang's looking into that same thing. These cities are part of China's vital, growing economy, but at the same time, this rapid modernization, what is it coming at the cost of?" Yang's choice to explore this phenomenon through this particular combination of ancient and contemporary techniques plays into China's notion of itself, according to Kelly, "not as a nation-state, which is a European idea, but as a 'civilization-state.' They look back thousands of years, and they see themselves as a continuation of that, not of this 1900s nation-state of China. So he's using the perfect medium." Even the decision to present the images in black and white comes with echoes of that Song Dynasty tradition, in which monochromatic images were a deliberate choice. "There was some critique [at the time] that color could sometimes obscure brush strokes," Kelly says. "It was not only about the overall image; a brushstroke could reveal the inner nature of that particular artist, more so than a biography." And that "inner nature" played a crucial role in Song Dynasty landscapes, adding to the complexity of the way Yang has taken that style into the 21st century. His works convey an ongoing collision between old and new worlds, in a way that makes it harder and harder to find serenity. "When Song Dynasty painters created their landscapes," Kelly says, "they were not just meant to portray a mountaintop; it was either to show the harmony of the universe, or later, as an escape for the individual painter. It was a symbol to represent your inner mind. ... The locked-in-ness of human habitation is what humans naturally abhor, and those landscapes were meant to represent an escape. In Yang's paintings, that escape is no longer there. The city has now become the mountain itself."